Applied Processor and Measurement, Inc. has been supplying electronic signal conditioners for industrial and automotive applications and equipment integrators for nearly 25 years. Please use the tables below to select the signal conditioner for your application. The Model SGC-200 module provides two amplified voltage outputs proportional to current across an internal sense resistor for current measurement of PWM pulse solenoids and DC motor applications. 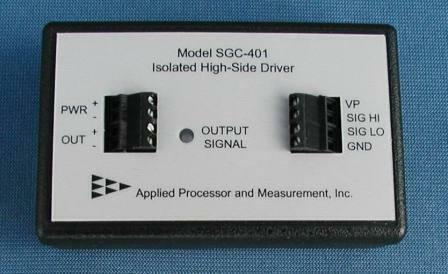 The Model SGC-400 module turns a low drive signal into a 50W peak low-side drive control signal for PLC and PC solenoid and actuator drive applications. The Model SGC-401 module turns a low drive signal into a 50W peak high-side drive control signal for PLC and PC solenoid and actuator drive applications. 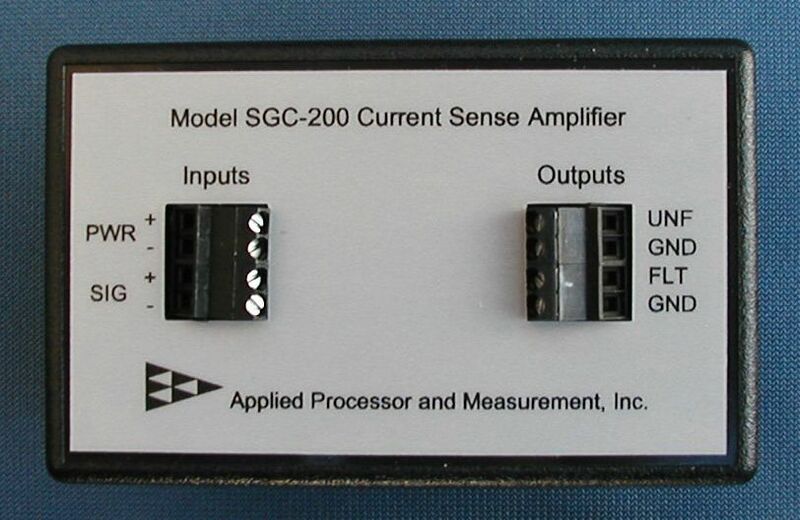 The SGC-100 converts a pulse/signal into two 0 to 5V outputs proportional to signal frequency and duty cycle. The SGC-100 is intended for general purpose PWM monitoring in industrial control and automotive applications. The DFA-100 is a general purpose two channel difference amplifier for differential to single ended signal conversion for industrial control applications. Signal conditioning elements may be designed to your exacting specifications at a very reasonable cost. APM, Inc. is also able to modify or re-package an existing design for use in a production application. We welcome you to attach your specifications to an e-mail using the link below, or call and discuss your application with one of our engineers. In addition to our signal conditioning product line, we offer complete engineering design services for embedded control based solutions. Please refer to our Electronic Engineering Services web page for further information.